Ah, the sweet serenity of the beautiful Camp Crystal Lake set in a beautiful forest planted right in the middle of a peaceful New Jersey countryside. It's a fantastic destination for campers, friends, and family alike with clear blue waters, rich, wood cabins, and tons of locations for hiking and sitting by the fire. Can't you just imagine sitting back and relaxing on the dock? Maybe you could even enjoy a bit of a swim on those hot, summer days. 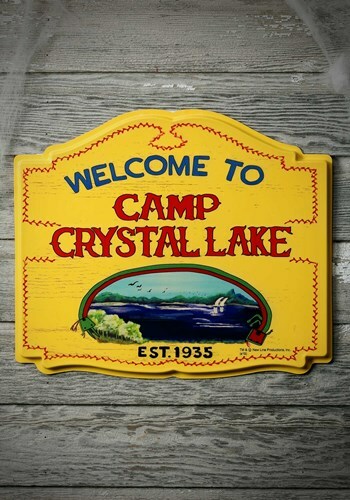 The camp was established all the way back in 1935 with only a single accident in its entire history. It's now gone unsupervised for a while as a result, but the sign still remains there, warning... We mean welcoming vacationers to its wonderful location. Ready to have your own fantastic little lake party at home? This sign is perfect for hanging up out front to let everyone know exactly what they're in for... A fantastic time of food, fun, and friends we're sure everyone will find to be an absolute scream! This sign was actually better than I expected. It is made of a thick plastic and very detailed. The clip on the back is weak, but I just reinforced it with some gorilla tape. It looks awesome hanging above our life size Jason prop. I know the description said plastic, but I wasn't expecting extremely cheap plastic (the yogurt I buy comes in better plastic). Way too overpriced for the quality. The packaging was non existent so the sign arrived damaged. It was bent and cracked in more than one place. I do not recommend this product unless they lower the price to $5 to justify the poor quality.